Plaster cast of a panel depicting St. John the Evangelist, after the gilt bronze original, on the door of the Baptistry of S. Giovanni, Florence. In 1401, the Arte dei Mercantanti di Calimala (the guild of the merchants dealing in foreign cloth and exporting cloth) decided to commission a second bronze door for the Baptistry of Florence, to accompany the door completed by Andrea Pisano (about 1295-1348/9) in 1336. A competition was held for which seven entrants submitted trial reliefs of The Sacrifice of Isaac. Lorenzo Giberti's entry was chosen in preference to that of his nearest rival, Filippo Brunelleschi. On 23 November 1403, the contract for the door was allotted to Ghiberti and his father, Bartolo di Michele, and the door was executed between 1403 and 1424. The format was intended to harmonize with that of the earlier door, comprising a similar scheme of twenty-eight panels, each containing a quatre-foil. 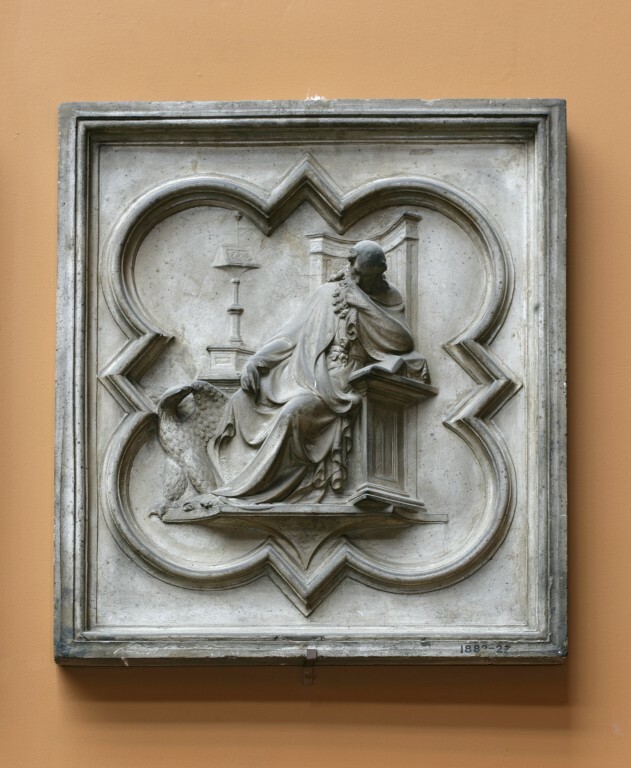 The twenty upper reliefs containing scenes from the New Testament, and the eight lower panels containing single figures of the Evangelists and Church Fathers, complement Andrea Pisano's scheme of twenty scenes from the life of St John the Baptist above eight figures of Virtues. 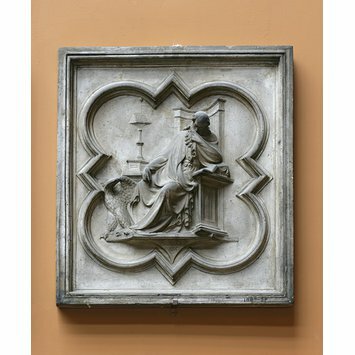 Ghiberti slightly altered the proportions of the panels, and replaced Andrea Pisano's dividing lattice of studs and rosettes with a rich foliate ornament. On Easter Sunday (19 April) 1424, the doors were set up at the East entrance to the Baptistry, facing the Cathedral. In 1452, they were moved to their present location, the North Entrance, when they were supplanted by Ghiberti's second bronze door, the Gates of Paradise.